Apparently like a picture of me in my pjs as a kid. Today I looked at my weblog and found over 2200 hits from the AOL proxy server on 27 March from 4am through 6pm. Fortunately AOL aggressively caches, so they were all HEAD hits which doesn't pull down a new copy, just checks to see if it is the same version they already have. The Easterbunny found the chewing gum 'cigarettes' of her youth and gave some to Joe Cool. Last night was the opening for the Merrimack Middle School production of "Dear Edwina, Jr". 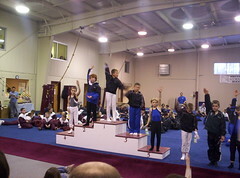 See all the photos here: NH State Gymnastics Championships 2005. Trevor did great today -- He was 6th in the all around for Level 7 (8 & 9 year old) and will be going to the Regional competition next month in Connecticut. 6th in the All Around with a 49.55. And it was the first time in quite a while since the home phone was registered with the National Do Not Call Registry. somewhere on D.W. Highway in town. The telemarketer said he was calling from New Rochelle, NY and caller ID caught his number as: 845-362-8732 and 'D,R G TELEMARKE'. He said my number must not be on the do not call list since he called me. I just checked with donotcall.gov and we've been on it since 6/29/2003. I've submitted a complaint and we'll see what happens. Cool! John Edwards will be podcasting! Starting next week, John Edwards will be podcasting. Is he the first US politician to use this new distribution media? Link thanks to Oliver Willis on Oliver Willis -- Like Kryptonite to Stupid (a silly name, but interesting political blog). From time to time our well will run dry -- especially on Sundays after a few loads of laundry, dishwasher runs and everyone getting a shower -- but will fill up overnight. That didn't happen this Monday. The old water expert guy diagnosed the problem as a dry well, not a pump problem. 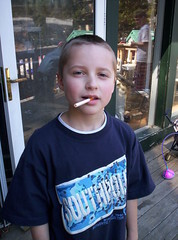 Of course he was the guy who put in the new pump back in '00. Some new water experts from Hollis found the water tank's bladder was broken and not letting it fill up. That was replaced and they also lowered our well's pump by 80' to around 380' down. The current 300' is a magic point because that is the deepest a cheap pump motor will handle. All that for only $600. Yay! There is a 50/50 chance that will fix our water problems permanently, although at a more convenient time we'll probably go to town water. At least we can flush the toilets again. Here are some short videos taken with our cheap camera of Trevor doing his floor routine at last week's Winter Invitational at Gymnastics Village. The last one is about half of the actual routine. 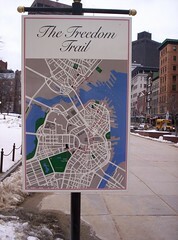 Last Monday I took the school agers down to Boston and walked some of the Boston Freedom Trail. Of course no trip is complete without a stop for food in Chinatown. Yum!